Day 331: Change Can Be Tough . . . So, by now anyone who reads our ramblings on a regular basis has figured out that we are just slightly a bubble off-center. Our sense of humor is somewhere between The Beverly Hillbillies and Monty Python’s Flying Circus – oh well, we just like to have a good time regardless of the situation. After spending the night in Kerrpatch with P & L and having a hearty breakfast on the deck at Taqueria Jalisco (another one of the places we love to dine at when in town) – we popped over to Casa del Vino’s remote location . . . aka “the West Crest House”. We knew we had a couple of chores to do before our renter was back to finish packing up and vacating the house. So in we jumped . . . bet you didn’t know that two bedrooms of fairly decent size could be painted in less than an hour and a half – well four hands working together can do just about anything – bamn . . . check that task off “the list”. Next up – put a final coat of fresh paint on the front door . . . this was painful for Jean – ya see, in EVERY house we’ve ever owned the front door has ALWAYS been painted red – why, because growing up EVERY house Jean lived in (with the exception of the Whittier house) had a red front door compliments of Margaret (aka Mom) . . . it was just a tradition being carried forward – well, the realtor said the red had to go . . . fighting mental tears, Jean painted red to brown (boring . . . but, if it sells the house – acceptable). Ok, that sad task being done – next up was changing out the mailbox that we had come to know and love . . . yep, another story – ya see, when we purchased the house back in 2003 we thought it was too funny that the mailbox said “MacDonald” – obviously the woman who had lived there since the 80’s was named MacDonald . . . well, most people – which we are not (reference sentence two of this blog) – would have immediately changed out the mailbox . . . well, what more can we say – we didn’t because we thought it would be fun. And we must tell you that over the years, it was VERY fun to watch people coming to see us pull up in front of the house – look at the address – look at the mailbox – shake their head in confusion – and finally call us from their cell phone to confirm they were at the right house . . . which they were and chuckled when they looked up and saw us waving from the front windows. But alas (a shout out to poor Yorick) – well, the realtor said the mailbox had to go . . . fighting mental tears, Brian changed out the mailbox (boring . . . but, if it sells the house – acceptable). So, now our house has a brown door and a nice shiny black metal mailbox – just like everyone else on the block – – – oh well, at least we have our memories to keep us young – and our sense of humor isn’t going anywhere anytime soon – it can’t be painted or replaced! After our chores were finished we popped back to our “B&B” and were greeted by P&L with tall glasses of ice water to rehydrate – not sure about where you are, but it was VERY hot here today – we worked up quite a sweat and had two glasses of H20 before L pulled some homemade epanadas out of the oven and we cracked open a bottle of wine that was picked up at Western Beverage in Ktown for less than $8.00 – yes, we were a bit concerned a) it was so cheap and b) it was a white . . . BUT, we must admit it was not so bad. 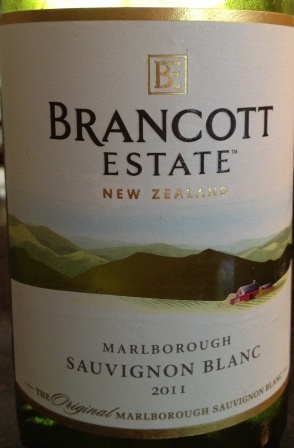 Our tasty treat was a 2011 Sauvignon Blanc from Brancott Estate in Auckland, New Zealand. On the nose, it was crisp and citrus all the way – kind of like having a grapefruit at the end of your sniffer. At first sip we recoiled from the tartness – almost overpowering – but, as it warmed up, the zing eased up and some really nice flavors came shining through. Would definitely buy again and have with some salmon, creamy cheese or some asparagus. And the price can’t be beat . . . a bargain – will need to swing by and get some more of this puppy. One other really cool thing about this wine is that it has a QR code on it – you scan, download an app and what fun . . . you get to go to some really neat virtual landing pages with information about the wine, food pairing, the winery, climate (you can make it rain on your phone) and facts about the region. It made for a great time before we climbed into the car and headed back to San Marcos. As you look around your house – what special touches have you added? A crazy rug, a loud room color, some funky decorations (we have a lava lamp tucked away somewhere) – whatever it is . . . make your abode speak volumes about who you are! As you decorate, remember to enjoy responsibly and recycle whenever possible! Categories: Uncategorized | Tags: Auckland, Brancott Estate Winery, Kerrville, New Zealand, Sauvignon Blanc, Western Beverage | Permalink.